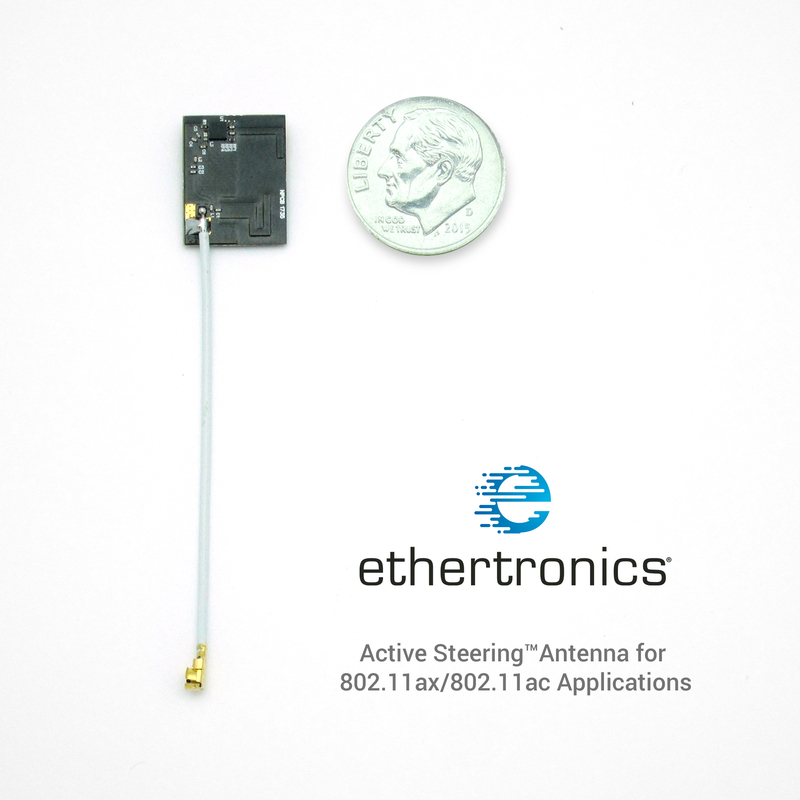 Ethertronics, the leader in high performance antenna system solutions, today announced its next-generation Wi-Fi Active Steering™ platform, based on the EC477 Active Steering Processor and the EC624 Active Steering™ Antenna Switch. Combined with Ethertronics' patented Active Steering Antenna architecture, this system delivers 2x performance and coverage benefits of Active Steering Technology in a flexible, cost-optimized solution and provides seamless integration for both broadband gateway and client platforms. Ethertronics' latest Active Steering solution doubles throughput, range, and efficiency for high-performance 802.11ax/802.11ac systems and has been optimized for today's market-leading Wi-Fi access point and client solutions. Additionally, the Active Steering technology implemented in the EC477/EC624 family provides performance and scalability for next-generation 802.11ax applications. "Ever growing at-home data usage, multi-user / multi-channel consumption of ultra-HD content, and rapidly increasing deployment of IoT devices inside and outside are driving the need for consistent Wi-Fi throughput, capacity and coverage throughout the home," said Vahid Manian, Chief Operating Officer, Ethertronics. "Our Active Steering systems enable operators and OEMs to develop and deploy high-performance Wi-Fi solutions which maximize throughput and range, reducing the need for expensive service calls and expert onsite device deployment." Ethertronics' new EC477 and EC624 family improves upon its previous generation Active Steering solution by reducing design costs and providing greater flexibility in antenna solution choice. The EC477/EC624 solution reduces design complexity and cost via its innovative Data-Over-Coax (DOC) interface, which allows Active Steering signaling to coexist on the same physical cable as the main RF signal without introducing any degradation of the main Wi-Fi signal. The DOC interface eliminates the need for custom connectors and signaling cables, which significantly reduces the system BOM and enables easier deployment of off-PCB antennas to maximize Wi-Fi radio link performance. Wi-Fi Active Steering technology generates multiple radiation patterns from a single antenna structure, allowing one antenna to operate as four different antennas. Each antenna operates as a system to optimize radio link performance in real-time on a per-antenna / per-client basis. Ethertronics Wi-Fi Active Steering solutions have been shown in real-world testing to deliver 2X or greater throughput and coverage improvements, particularly under conditions of moderate to weak Wi-Fi signal coverage. The performance benefits of Active Steering are additive to gains realized through MIMO and beamforming techniques, and are scalable to next-generation 802.11ax technology. 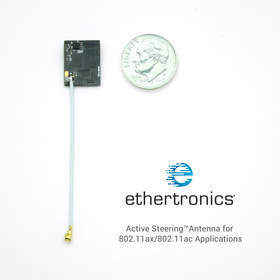 For more detail about Active Steering technology, visit www.ethertronics.com/active/.